4Leaf Zune Video Converter provides possibilities for you to finish Zune video (MP4) converting conveniently. It provides an easy and completed way to convert video formats such as AVI, MPEG, MPG, WMV, Xvid, DivX, ASF, MOV, VOB, etc to Zune video (MP4) with the perfect output quality. With the very easy to use interface you can also extract a section out from the video. Output profiles and all needed parameters have been set up well in advanced. An advanced software for converting all your video files to Zune video (MP4). 4Leaf Zune Video Converter works efficiently and steady on Windows 98, Me, NT, 2000, XP, 2003 and vista. Video to Zune video (MP4) conversion becomes so easy and fast, just one click! 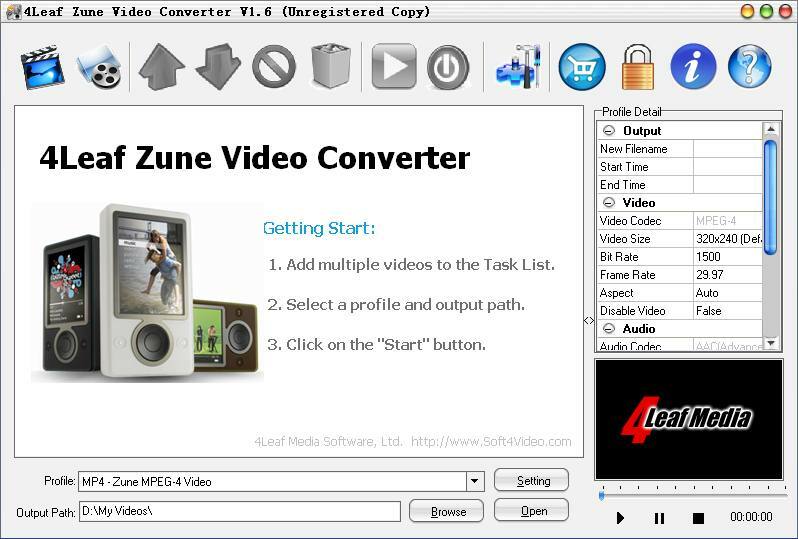 Free download 4Leaf Zune Video Converter to have a wonderful experience now! The best video conversion software that converts video files to all videos. Convert all your Videos to Zune Files! Convert video files AVI, MPEG, MPG, WMV, Xvid, DivX, ASF, MOV, VOB to Zune. 4Leaf WMV Video Converter is a powerful and universal WMV converter. An easy-to-use video converter for iPod video (MP4,H.264) converting. iOrgSoft Zune Video Converter is the best Zune MPEG-4 converter, MP3 converter. Is powerful Zune video and audio conversion software. Qweas is providing links to 4Leaf Zune Video Converter 1.7.2 as a courtesy, and makes no representations regarding 4Leaf Zune Video Converter or any other applications or any information related thereto. Any questions, complaints or claims regarding this application 4Leaf Zune Video Converter 1.7.2 must be directed to the appropriate software vendor. You may click the publisher link of 4Leaf Zune Video Converter on the top of this page to get more details about the vendor.